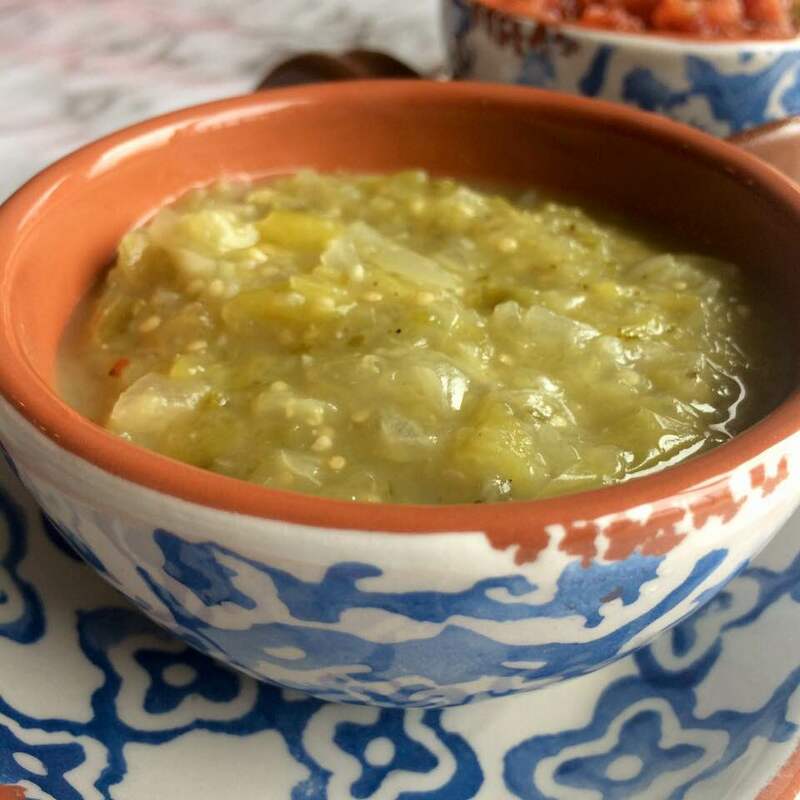 Until this recipe for Roasted Salsa Verde, anything I tasted with those green tomato-looking tomatillos always tasted super bitter to my palate. To say I just wasn’t a fan is putting it mildly. At many a Tex-Mex restaurant I visited, it took me no time to shove bowls of Salsa Verde as far away from me as possible. Funny think was, though, I didn’t mind it when I added my go-to jar of Mrs. Renfro’s Jalapeno Green Salsa, the HOT version. to my favorite sauce for a batch of Sour Cream Chicken Enchiladas. But eating it straight from the jar? No way. Just recently I had a hankering for my friend Karen’s version of those delicious Sour Cream Chicken Enchiladas. I needed a jar of salsa verde but couldn’t find Mrs. Renfro’s at the local IGA grocery store. I was afraid to try another brand because her recipe specifically stated Mrs. Renfro’s (with a double underline). I started googling for a substitution. 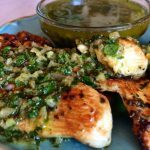 In my search I found what looked like a keeper recipe for a homemade salsa verde. It looked simple enough to try. 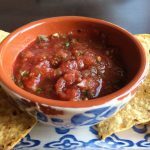 With a quick trip to the Mexican grocer and a few adjustments to the recipe, I created this version. And I have to admit, it’s one I REALLY like. It’s fresh without that bitter taste (still trying to figure out what caused that in the first place). It tastes delicious in my Sour Cream Chicken Enchilada sauce and just plain on a crisp tortilla chip. Roasting the tomatillos, onion and pepper and then cooking the entire mixture for a few minutes makes all the difference in the world. It mellows the flavors to absolute perfection. Also, depending on how hot you like it, remove the some or all of the seeds and membrane from the serrano or jalapeno pepper. I like mine pretty spicy, so I leave in half. I’m sorry that Mrs. Renfro and I have to part ways but please pass the chips and salsa because I can’t get enough of this one! REMOVE from oven and PLACE in a food processor or blender with the garlic, oregano, cumin, salt, lime juice, and vinegar. PUREE until smooth. TRANSFER to a medium saucepan, BRING to a BOIL over high heat. REDUCE heat to medium-low. SIMMER for approximately 10 minutes. ADD the cilantro. COOL and SERVE.